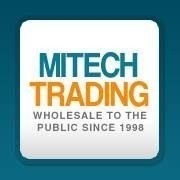 MITECH Trading was founded in July 1998. We strive to provide our customers with wholesale products available at the lowest possible prices. Though we focus our attention to providing our customers with low prices, we also firmly stand by our products offered on our website and believe that our products will provide satisfaction to our customers. We are working hard to provide our customers with the best possible shopping experience, and our goal is to provide the VERY BEST customer service. This is reflected in our consistent A+ rating from BBB through the years.